A city police officer has been charged with assaulting his estranged wife during a visit to her house on Christmas Day. 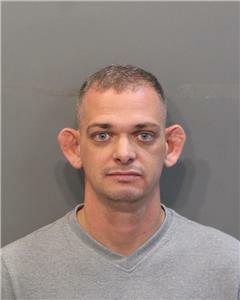 James R. Oister, 34, was charged with domestic assault. He was placed on leave pending the outcome of the case. County deputies who investigated the case said the estranged wife stated that Oister came to her home to see the kids for Christmas. She said their three children were present for the incident. She said Oister became argumentative over some Christmas gift packaging. She said after a few minutes of arguing she told him she was going to turn on a tape recorder. She said this angered him and he grabbed her arm with one hand and her throat with the other. She said he pinned her against a door to the sun room. She said he threw her into a cabinet beside the door, causing her to hit her head and fall to the floor. She said her uncle tried to get him away from her, but Oister told the uncle to "back the f--- off." She said Oister tried to pick her up by her clothes while she was on the ground. The estranged wife said the three children then tried to put themselves between her and Oister. She said as he was walking away, the eight-year-old middle child, kicked her father. She said the child did not have shoes on and this caused her to hurt her toe. She said as Oister left he threw some gifts and also punched a hole in the wall. The deputies said the estranged wife had red marks on her neck as well as a cut on the right side of her bottom lip. She had a bruise on her left foot and a mark on the right side of her forehead. The estranged wife said she did not call police until she had taken the children to her mother's house in Cleveland and returned home.